Contact Corsiglia McMahon & Allard, L.L.P. Results Count. Hundreds of Millions Won for Injured Victims. Timothy McMahon: As personal injury attorneys we’re trying to help people that are generally catastrophically injured. And our job is to get them back on their feet, to help them get back to work, to help them get back to their families. And we do that by holding accountable those people, those companies, those corporations that have caused their injuries. Robert Allard: The goal obviously is get the case resolved as quickly as possible to the client’s satisfaction, but the top dollar is not going to be paid unless the defense knows that you can and are able to successfully try a case. Robert Allard: Primarily, I'm representing people who have been injured through the fault of others. And through my representation my goal and I mean this sincerely, is not just to put money in my client's pockets. That's important. It's important for them and for their families. But as important to me, I want to make sure that we're achieving social change through this litigation. For example, making rules so that people aren't hurt in the future, or making it so that products are made safer. Those are as important to me in what I do. Because I think we as lawyers are uniquely positioned to help other people. My clients come to me in need of help and I take that very seriously. And when I agree to represent them, I undertake the task of helping them in every way. Their injuries have affected their lives and their family's lives and through what I do I can make their lives better. And that is the most important thing to me. Bradley Corsiglia: My over 20 years of experience in handling medical negligence cases I believe sets me apart from most other lawyers who handle these types of cases. Unlike a lot of areas in the law, handling medical malpractice cases require you to have a broad background in medicine which allows you then to not only evaluate the case but also to work up the case in dealing with the experts and taking the depositions of the defendant doctor and the defendant experts. And so it’s only when you’ve acquired that type of knowledge over many years can you be successful and effective. For me personally, the best thing that I can do for a family or a person who’s been injured as a result of medical negligence is to provide them with the financial security that they require to make sure they get the ongoing care they may need or other resources they need going forward. I think when a client contacts us they know that we’re honest, that we’ve given their case a thorough consideration and even if we don’t accept the case that at least they know that they got a sound evaluation from our office. Timothy McMahon: I have two unique aspects to my experience that makes me a great personal injury lawyer. I have a degree in biochemistry. My science background really helps, I think, understand the value of a case, the significance of the injuries and I can bring all of that knowledge back to my client to give them a full evaluation about what their case is worth and how we can best solve the problems with their case. Secondly, for the first 15 years of my career, I was a defense attorney defending the corporations that injured people were suing. I have learned through that experience how to analyze a case from the defense perspective. When you know the mind of the enemy, it’s just invaluable. If I know how they think, I am in their head and I can resolve my cases much better because I understand what they’re thinking, what their hot button items are to push, how to try the case and how to settle it if we can. I do really enjoy making a difference in my client’s lives. We’re here to help them, to get them a recovery, to get them back on their feet. 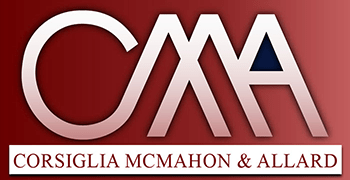 I absolutely cannot speak highly enough of CMA Law, particularly of Mr. McMahon, with whom I have had the most experience. My entire family and I trusted CMA with our case following a significant and life-altering vehicle accident, and to say they delivered is putting it lightly. They were reachable & personable at every stage of this arduous, complex, and scary process, made things easier at every stage, inspired us with confidence, and delivered results. If you're looking for a law firm to place the trust of you in your family in, look absolutely no further than CMA - this is your firm. Declan O.
I suffered a severe spinal injury while working as a farm mechanic in the Salinas Valley. The attorneys -Tim McMahon and Mark Sigala were fantastic from the beginning. They fought for me over 3 long years and in the end, we won a difficult liability case against the farm company who was using dangerous equipment. The defendants in the case tried everything to put the blame on me and even claimed I was their employee in order to avoid civil responsibility. Tim and Mark never gave up on me and my case. I cannot recommend them highly enough. They are fighters. Adrian A. Copyright © 2019, Corsiglia McMahon & Allard, L.L.P.